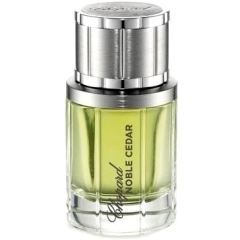 Noble Cedar is a perfume by Chopard for men and was released in 2011. The scent is woody-fresh. The production was apparently discontinued. Noble Cedar opens with an extremely harsh and openly synthetic sort of cedar-tar note with a subtle yet pungent sort of nutty-metallic aftertaste, a slight “burning rubber” feel, and a couple of other depressing key nuances of many low-quality drugstore woody fragrances (or, “fascinating & totally legitimately overpriced avantgarde post-woody niche scents”). Surely more wood than nobility. The nice thing is that it is undoubtedly simple as it smells nearly as applying a couple of aromachemicals out of their bottle, right on skin; so if you like the smell – a raw albeit artificial woody galore - it’s a score. Within some 30 minutes though, the “synthetic cedar” part comes to a transition, and a smooth, way more enjoyable salty vetiver note pops out, basically becoming soon the main note. Bright and clean, which here feels like the balmy sunny breeze after a storm. I don’t know how Noble Vetiver from this same line smells, but this is definitely a vetiver scent at this point – and so it will remain for a couple of hours before starting to vanish. The opening isn’t really promising, but overall Noble Cedar isn’t that bad – just keep in mind it’s mostly a vetiver scent except for the obnoxious opening stage. Overall still too cheap for me, but almost decent. As you can tell from my profile picture I have a fondness for piney, resinous and aromatic fragrances. So when I stumbled across Noble Cedar and saw its list of notes, I went all weak kneed imagining a scent that would take me back to the forests of the upper midwest. Unfortunately, the only thing with weak knees in this scenario was Noble Cedar itself. I would guess Chopard was going for a cool, airy, idealized perfume of cedar rather than the solidity of the entire tree. But achieving serenity or quiet in a fragrance doesn’t mean it should lack substance or character. If anything, Noble Cedar needs a wider range of subtle cedar and resin notes to effectively articulate the character of hushed, stoic nobility. Instead, the lackluster cedar accord left me with the feeling of sitting on a lone cedar stump in the middle of a birch forest. Why birch? Because birch essence is the one thing working in Noble Cedar's favor. Birch is often used to give a cool, mint like airiness to a fragrance without imparting the odor of mint. And it would do this job admirably if there were enough cedar scent to animate and diffuse. Along with the overall character, longevity is also extremely weak. I certainly gave Noble Cedar a fair chance to prove itself by testing it very thoroughly. I had to, its longevity is so poor it required a lot of reapplying. I really wanted to like this fragrance. I really did. But until it’s reformulated as Noble Cedar Extreme or some other such thing it’s just a sapling in a forest of superior cedar fragrances. Write the first Review for Noble Cedar!